I’ve got a Beewi temperature sensor. I’ve been playing with it previously. 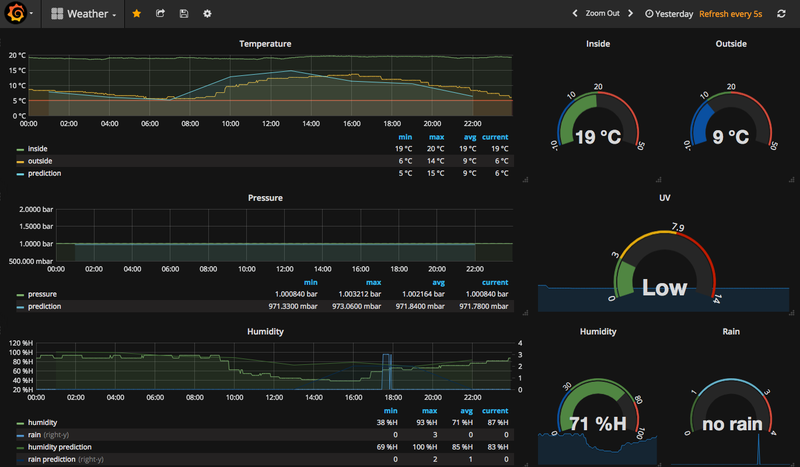 Today I want to show the temperature within a Grafana dashboard. I want to play also with openweathermap API. Fist I want to retrieve the temperature from Beewi device. I’ve got a node script that connects via Bluetooth to the device using noble library. And finally another script (this time a Python script) to collect data from openweathermap API, collect data from node script and storing the information in a influxdb database. I’m running this python script from a Raspberry Pi3 with a Sense Hat. Sense Hat has a atmospheric pressure sensor, so I will also retrieve the pressure from the Sense Hat. I run this script with the Rasberry Pi crontab each 5 minutes. That means that I’ve got a fancy time series ready to be shown with grafana. Source code available in my github account. I’ve got a Wemo switch and a BeeWi temperature/humidity sensor. I’ve use them in previous projects. Today I want a control humidity level in a room. The idea is switch on/off a dehumidifier (plugged to Wemo switch) depending on the humidity (from BeeWi sensor). Let’s start. Project is available in my github account. Nowadays I’m involved with Arduino and iot, so I wand to do something similar with cheaper Arduino stuff. I’ve got a BeeWi Smart LED Color Bulb. I must admit I cannot resist to buy those kind of devices :). I can switch on/off the bulb and change the color using its Mobile App, but it’s not fun. I want to play a little bit with the bulb. My idea is the following one: First switch on the bulb in the mornint and set up the bulb color (Blue for example). Then change bulb color depending on my morning routine. And finally switch the bulb off. Now with this bulb’s color I know if my morning routine is on-time, just looking at the bulb’s color. For example if the bulb is red and I’m still having breakfast probably I’m late. The prototype is very simple. The bulb has a bluetooth interface and I’ve found a python script to control the bulb. I’ve changed a little bit this script to adapt it to my needs. Now I only need to set up the crontab within my Raspberry Pi to trigger the script and switch on/off the bulb and change the RGB color. In another post we play with Telegram bots to read temperature. Now I’ve adapted also my bot to switch on/off and change color of the bulb. Summer holidays are over. Besides my bush walks I’ve been also hacking a little bit with one idea that I had in mind. Summer means high temperatures and I wanted to control my fan. For example turn on the fan when temperature is over a threshold. I can do it using an Arduino board and a temperature sensor, but I don’t have the one Arduino board. I have several devices. For example a Wemo switch. With this device connected to my Wifi network I can switch on and off my fan remotely from my mobile phone (using its android app) or even from my Pebble watch using the API. I also have a BeeWi temperature/humidity sensor. It’s a BTLE device. It comes with its own app for android, but there’s also a API. Yes. I known that one Arduino board with a couple of sensors can be cheaper than one of this devices, but when I’m a shop and I’ve got one of this devices in my hands I cannot resist. I also have a new Raspberry pi 3. I’ve recently upgraded my home multimedia server from a rpi2 to the new rpi3. Basically I use it as multimedia server and now also as retro console. This new rpi3 has Bluetooth so I wanted to do something with it. Read temperature from the Bluetooth sensor sounds good so I started to hack a little bit. I found this post. I started working with Python. The script almost works but it uses Bluetooth connection and as someone said in the comments it uses a lot of battery. So I switched to a BTLE version. I found a simple node library to connect BTLE devices called noble, really simple to use. In one afternoon I had one small script ready. The idea was put this script in my RP3’s crontab, and scan the temperature each minute (via noble) and if the temperature was over a threshold switch on the wemo device (via ouimeaux). I also wanted to be informed when my fan is switch on and off. The most easier way to do it was via Telegram (I already knew telebot library). It works but I wanted to keep on hacking. One Sunday morning I read this post. I don’t have an amazon button, but I wanted to do something similar. I started to play with scapy library sniffing ARP packets in my home network. I realize that I can detect when my Kindle connects to the network, my tv, or even my mobile phone. Then I had one I idea: Detect when my mobile phone connects to my wifi. My mobile phone connects to my wifi before I enter in my house so my idea was simple: Detect when I’m close to my home’s door and send me a telegram message saying “Wellcome home” in addition to the temperature inside my house at this moment. I have one node script to read temperature and one Python script to sniff my network. I can find how to read temperature from Python and use only one script but I was lazy (remember that I was on holiday) so I turned the node script that reads temperature into a gearman worker. Now I only need to call this worker from my Python sniffer and thats all.